This North Myrtle Beach resort is just blocks away from the easy-to-find intersection of Highway 17 and Highway 22. The Myrtle Beach Mall, which features Bass Pro Shops and Islamorada Fish Company Restaurant, is at this intersection and so is one of the area’s two Tanger Outlet Centers. Beach Club II is on the beachfront and close to all the magnificent Myrtle Beach attractions and North Myrtle Beach amusements. Beach Club II is an oceanfront North Myrtle Beach resort in the Windy Hill section of North Myrtle Beach, South Carolina. There are nine stories in this North Myrtle Beach resort and each of the North Myrtle Beach rentals at Beach Club II features an oceanfront view. From your oceanfront balcony you will be able to see the oceanfront pool deck below. 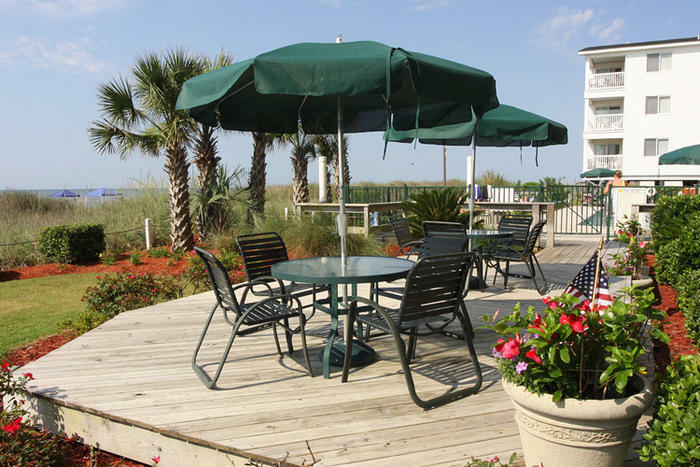 Additionally, there is a wooden sun deck at Beach Club II and a nearby grill area so you can have a family cookout on the beachfront during your North Myrtle Beach vacation. What a wonderful memory to add to your North Myrtle Beach vacation scrapbook. The oceanfront North Myrtle Beach condominiums at Beach Club II are three bedrooms. That is plenty of space for up to eight people. There are three baths in these condos in North Myrtle Beach, SC and that is just the beginning of the conveniences you will find here. The kitchens in these North Myrtle Beach rentals are quite large and feature everything you need for a delightful North Myrtle Beach vacation. There are full-size appliances in these kitchens that include a microwave, refrigerator, stove and dishwasher. You will find dishes, cookware and utensils in these kitchens in case you want to make a snack or a meal in the comfort of your North Myrtle Beach condominium. Elliott Beach Rentals is not affiliated with onsite management or the HOA of Beach Club Ii.